It’s a nightmare scenario. 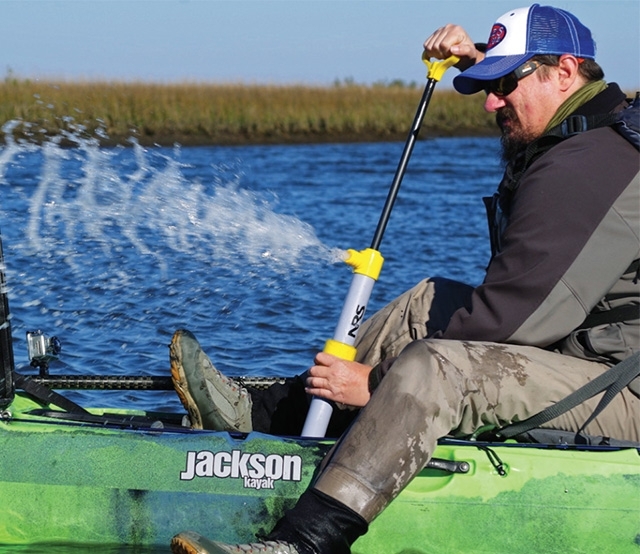 Your kayak springs a leak and you’re miles from home—what do you do? Freak out? Probably. Fix it? Definitely. Follow these steps and you won’t go down with the ship. 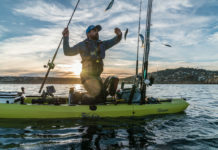 We take for granted that plastic fishing kayaks are indestructible. In fact, a small crack or pinhole can let in a surprising amount of water. 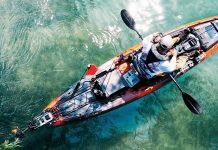 If you are a trained paddler, attempt a T-rescue to empty the boat and inspect for damage. 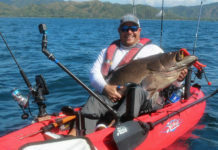 Even full of water, most kayaks will continue to float, and giving you time to pump out and paddle to shore for repairs. Always carry a small hand pump to remove water. If you open a hatch to pump out water, watch that more water doesn’t splash into the boat. With most of the water removed, head to the beach. A small hole or missing drain plug can be fixed with duct tape. Empty the remaining water and dry the section that will be repaired. Rub the area with alcohol swabs to remove dirt and grease and speed up the drying time. To fill a missing drain plug, wad up a ball of duct tape and stuff it into the hole. Then use strips of duct tape to hold the wad in place. For a larger hole or a sturdier temporary fix, use Water Weld. The stuff looks like Silly Putty, but it is seriously strong. Spread the epoxy paste across the large crack, then let it cure for 30 minutes. To perform a major repair while on a road trip, I carry a scrap of polyethylene plastic and a cautery pen. This is a battery operated device surgeons use to cauterize blood vessels. I use it to melt plastic into large cracks and holes. A handful of zip ties will fix rigging or reattach a padeye.